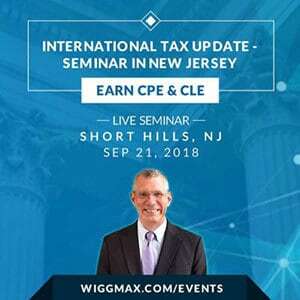 NJ CPE CLE Seminar Sept 2018 | Chatham NJ Attorney | Paul Wigg-Maxwell, Esq. Grow your tax firm with less risk and waste of valuable time. Is your company prepared to take care of your customer’s international tax problems? Otherwise, you might be exposing your company to your customers and fraud allegations to penalties which could transcend the value of the assets. Are you confident in your knowledge of International Tax rules to advise your clients? Do not fall prey by failing to create an international tax ability or disappoint your customers by not supplying the specialist international tax advice they want. The International Tax Reporting and Compliance Update Seminar supplies attorneys, lawyers and other tax practitioners a way to complying with the newest International tax rules. We packaged this seminar with timely important topics that will improve your professional tax service’s value. Keep your company on top with International tax law understanding produced from years of experience employing international treaties and rulings to real life instances. Changes to the international tax legislation impacts a fantastic proportion of companies, transactions and people lives. Register today to start guarding your customers and your company. This program has been approved by the Board on Continuing Legal Education of the Supreme Court of New Jersey for two (2) hours of total CLE credit. Of these, none (0) qualify as hours of credit for ethics/professionalism, and none (0) qualify as hours of credit toward certification in civil trial law, criminal trial law, workers compensation law and/or matrimonial law. International Tax Seminar for Continued Professional Education and Continued Legal Education. Learn techniques, ideas and strategies to correctly and swiftly address your customer’s International tax challenges such as IRS Form 5471 and Section 965. Expand your high value services with International Tax Advisory services. Form marketing alliances with accountants, attorneys, and tax specialists! Earn 2 CPE or CLE Credits. Accountants and Lawyers who advise clients on U.S. and International taxes. Senior professionals and associates who help clients with tax consequences of the company, investments and assets or bank balances.